The Active Ocean 1082X Swimform by Anita is a clear silicon reduced prosthesis which is perfect f.. The Authentic 1020X Breast Form is noticeably natural. With its outstanding fit and lightness, th..
Pocketed bra CAMY features delicate and feminine appearances while extremely soft touch fabric, e.. This mastectomy bra is indeed something very speacial! Camy creates a sophisticated, feminine loo..
Indulge in perfect harmony. Swiss embroidery lends post surgery bra Charlize its unique and femin.. The Anita EquiTex 1057X Breast Form is a multifunctional, lightweight prosthesis with a silicone ..
Floral translucent lace make bandeau top FLEUR a clever accessory under cut out shirts or bl.. The Anita Stella Bra 5715X is a moulded cup bra, which offers excellent concealment, along with a.. The Anita Tri-Tex1055X Breast Form has a ribbed design. This prosthesis has a soft, breathable mi.. 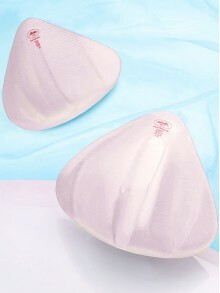 The Anita TriNature Softlite 1051X Breast Form is designed with the patented FlexGap technology w.. The Anita Safina Bra has an opaque, lined lower cup with tulle embroidery in a semi-sheer upper c..